Not to be confused with the financial concept of mean reversion. In statistics, regression toward (or to) the mean is the phenomenon that arises if a random variable is extreme on its first measurement but closer to the mean or average on its second measurement and if it is extreme on its second measurement but closer to the average on its first. To avoid making incorrect inferences, regression toward the mean must be considered when designing scientific experiments and interpreting data. Historically, what is now called regression toward the mean has also been called reversion to the mean and reversion to mediocrity. The conditions under which regression toward the mean occurs depend on the way the term is mathematically defined. The British polymath Sir Francis Galton first observed the phenomenon in the context of simple linear regression of data points. 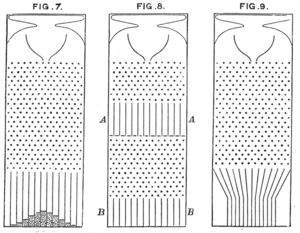 Galton developed the following model: pellets fall through a quincunx to form a normal distribution centered directly under their entrance point. These pellets might then be released down into a second gallery corresponding to a second measurement. Galton then asked the reverse question: "From where did these pellets come?" The answer was not 'on average directly above'. Rather it was 'on average, more towards the middle', for the simple reason that there were more pellets above it towards the middle that could wander left than there were in the left extreme that could wander to the right, inwards. As a less restrictive approach, regression towards the mean can be defined for any bivariate distribution with identical marginal distributions. Two such definitions exist. One definition accords closely with the common usage of the term "regression towards the mean". Not all such bivariate distributions show regression towards the mean under this definition. However, all such bivariate distributions show regression towards the mean under the other definition. Jeremy Siegel uses the term "return to the mean" to describe a financial time series in which "returns can be very unstable in the short run but very stable in the long run." More quantitatively, it is one in which the standard deviation of average annual returns declines faster than the inverse of the holding period, implying that the process is not a random walk, but that periods of lower returns are systematically followed by compensating periods of higher returns, as is the case in many seasonal businesses, for example. Consider a simple example: a class of students takes a 100-item true/false test on a subject. Suppose that all students choose randomly on all questions. Then, each student’s score would be a realization of one of a set of independent and identically distributed random variables, with an expected mean of 50. Naturally, some students will score substantially above 50 and some substantially below 50 just by chance. If one takes only the top scoring 10% of the students and gives them a second test on which they again choose randomly on all items, the mean score would again be expected to be close to 50. Thus the mean of these students would “regress” all the way back to the mean of all students who took the original test. No matter what a student scores on the original test, the best prediction of their score on the second test is 50. If choosing answers to the test questions was not random – i.e. if there were no luck (good or bad) or random guessing involved in the answers supplied by the students – then all students would be expected to score the same on the second test as they scored on the original test, and there would be no regression toward the mean. Most realistic situations fall between these two extremes: for example, one might consider exam scores as a combination of skill and luck. In this case, the subset of students scoring above average would be composed of those who were skilled and had not especially bad luck, together with those who were unskilled, but were extremely lucky. On a retest of this subset, the unskilled will be unlikely to repeat their lucky break, while the skilled will have a second chance to have bad luck. Hence, those who did well previously are unlikely to do quite as well in the second test even if the original cannot be replicated. The following is an example of this second kind of regression toward the mean. A class of students takes two editions of the same test on two successive days. It has frequently been observed that the worst performers on the first day will tend to improve their scores on the second day, and the best performers on the first day will tend to do worse on the second day. The phenomenon occurs because student scores are determined in part by underlying ability and in part by chance. For the first test, some will be lucky, and score more than their ability, and some will be unlucky and score less than their ability. Some of the lucky students on the first test will be lucky again on the second test, but more of them will have (for them) average or below average scores. Therefore, a student who was lucky on the first test is more likely to have a worse score on the second test than a better score. Similarly, students who score less than the mean on the first test will tend to see their scores increase on the second test. If your favorite sports team won the championship last year, what does that mean for their chances for winning next season? To the extent this result is due to skill (the team is in good condition, with a top coach, etc. ), their win signals that it is more likely they will win again next year. But the greater the extent this is due to luck (other teams embroiled in a drug scandal, favorable draw, draft picks turned out to be productive, etc. ), the less likely it is they will win again next year. If one medical trial suggests that a particular drug or treatment is outperforming all other treatments for a condition, then in a second trial it is more likely that the outperforming drug or treatment will perform closer to the mean. If a business organisation has a highly profitable quarter, despite the underlying reasons for its performance being unchanged, it is likely to do less well the next quarter. If the country's GDP jumps in one quarter it is likely not to do as well in the next. Baseball players who hit well in their rookie season are likely to do worse their 2nd; the "Sophomore slump". The concept of regression comes from genetics and was popularized by Sir Francis Galton during the late 19th century with the publication of Regression towards mediocrity in hereditary stature. Galton observed that extreme characteristics (e.g., height) in parents are not passed on completely to their offspring. Rather, the characteristics in the offspring regress towards a mediocre point (a point which has since been identified as the mean). By measuring the heights of hundreds of people, he was able to quantify regression to the mean, and estimate the size of the effect. Galton wrote that, “the average regression of the offspring is a constant fraction of their respective mid-parental deviations”. This means that the difference between a child and its parents for some characteristic is proportional to its parents' deviation from typical people in the population. If its parents are each two inches taller than the averages for men and women, then, on average, the offspring will be shorter than its parents by some factor (which, today, we would call one minus the regression coefficient) times two inches. For height, Galton estimated this coefficient to be about 2/3: the height of an individual will measure around a midpoint that is two thirds of the parents’ deviation from the population average. Galton coined the term "regression" to describe an observable fact in the inheritance of multi-factorial quantitative genetic traits: namely that the offspring of parents who lie at the tails of the distribution will tend to lie closer to the centre, the mean, of the distribution. He quantified this trend, and in doing so invented linear regression analysis, thus laying the groundwork for much of modern statistical modelling. Since then, the term "regression" has taken on a variety of meanings, and it may be used by modern statisticians to describe phenomena of sampling bias which have little to do with Galton's original observations in the field of genetics. Though his mathematical analysis was correct, Galton's biological explanation for the regression phenomenon he observed is now known to be incorrect. He stated: “A child inherits partly from his parents, partly from his ancestors. Speaking generally, the further his genealogy goes back, the more numerous and varied will his ancestry become, until they cease to differ from any equally numerous sample taken at haphazard from the race at large.” This is incorrect, since a child receives its genetic make-up exclusively from its parents. There is no generation-skipping in genetic material: any genetic material from earlier ancestors must have passed through the parents (though it may not have been expressed in them). The phenomenon is better understood if we assume that the inherited trait (e.g., height) is controlled by a large number of recessive genes. Exceptionally tall individuals must be homozygous for increased height mutations at a large proportion of these loci. But the loci which carry these mutations are not necessarily shared between two tall individuals, and if these individuals mate, their offspring will be on average homozygous for "tall" mutations on fewer loci than either of their parents. In addition, height is not entirely genetically determined, but also subject to environmental influences during development, which make offspring of exceptional parents even more likely to be closer to the average than their parents. This population genetic phenomenon of regression to the mean is best thought of as a combination of a binomially distributed process of inheritance plus normally distributed environmental influences. In contrast, the term "regression to the mean" is now often used to describe the phenomenon by which an initial sampling bias may disappear as new, repeated, or larger samples display sample means that are closer to the true underlying population mean. Regression toward the mean is a significant consideration in the design of experiments. Take a hypothetical example of 1,000 individuals of a similar age who were examined and scored on the risk of experiencing a heart attack. Statistics could be used to measure the success of an intervention on the 50 who were rated at the greatest risk. The intervention could be a change in diet, exercise, or a drug treatment. Even if the interventions are worthless, the test group would be expected to show an improvement on their next physical exam, because of regression toward the mean. The best way to combat this effect is to divide the group randomly into a treatment group that receives the treatment, and a control group that does not. The treatment would then be judged effective only if the treatment group improves more than the control group. Alternatively, a group of disadvantaged children could be tested to identify the ones with most college potential. The top 1% could be identified and supplied with special enrichment courses, tutoring, counseling and computers. Even if the program is effective, their average scores may well be less when the test is repeated a year later. However, in these circumstances it may be considered unethical to have a control group of disadvantaged children whose special needs are ignored. A mathematical calculation for shrinkage can adjust for this effect, although it will not be as reliable as the control group method (see also Stein's example). The effect can also be exploited for general inference and estimation. The hottest place in the country today is more likely to be cooler tomorrow than hotter, as compared to today. The best performing mutual fund over the last three years is more likely to see relative performance decline than improve over the next three years. The most successful Hollywood actor of this year is likely to have less gross than more gross for his or her next movie. The baseball player with the greatest batting average by the All-Star break is more likely to have a lower average than a higher average over the second half of the season. The concept of regression toward the mean can be misused very easily. In the student test example above, it was assumed implicitly that what was being measured did not change between the two measurements. Suppose, however, that the course was pass/fail and students were required to score above 70 on both tests to pass. Then the students who scored under 70 the first time would have no incentive to do well, and might score worse on average the second time. The students just over 70, on the other hand, would have a strong incentive to study and concentrate while taking the test. In that case one might see movement away from 70, scores below it getting lower and scores above it getting higher. It is possible for changes between the measurement times to augment, offset or reverse the statistical tendency to regress toward the mean. Statistical regression toward the mean is not a causal phenomenon. A student with the worst score on the test on the first day will not necessarily increase his score substantially on the second day due to the effect. On average, the worst scorers improve, but that is only true because the worst scorers are more likely to have been unlucky than lucky. To the extent that a score is determined randomly, or that a score has random variation or error, as opposed to being determined by the student's academic ability or being a "true value", the phenomenon will have an effect. A classic mistake in this regard was in education. The students that received praise for good work were noticed to do more poorly on the next measure, and the students who were punished for poor work were noticed to do better on the next measure. The educators decided to stop praising and keep punishing on this basis. Such a decision was a mistake, because regression toward the mean is not based on cause and effect, but rather on random error in a natural distribution around a mean. Although extreme individual measurements regress toward the mean, the second sample of measurements will be no closer to the mean than the first. Consider the students again. Suppose the tendency of extreme individuals is to regress 10% of the way toward the mean of 80, so a student who scored 100 the first day is expected to score 98 the second day, and a student who scored 70 the first day is expected to score 71 the second day. Those expectations are closer to the mean than the first day scores. But the second day scores will vary around their expectations; some will be higher and some will be lower. In addition, individuals that measure very close to the mean should expect to move away from the mean. The effect is the exact reverse of regression toward the mean, and exactly offsets it. So for extreme individuals, we expect the second score to be closer to the mean than the first score, but for all individuals, we expect the distribution of distances from the mean to be the same on both sets of measurements. Related to the point above, regression toward the mean works equally well in both directions. We expect the student with the highest test score on the second day to have done worse on the first day. And if we compare the best student on the first day to the best student on the second day, regardless of whether it is the same individual or not, there is a tendency to regress toward the mean going in either direction. We expect the best scores on both days to be equally far from the mean. Many phenomena tend to be attributed to the wrong causes when regression to the mean is not taken into account. An extreme example is Horace Secrist’s 1933 book The Triumph of Mediocrity in Business, in which the statistics professor collected mountains of data to prove that the profit rates of competitive businesses tend toward the average over time. In fact, there is no such effect; the variability of profit rates is almost constant over time. Secrist had only described the common regression toward the mean. One exasperated reviewer, Harold Hotelling, likened the book to “proving the multiplication table by arranging elephants in rows and columns, and then doing the same for numerous other kinds of animals”. The calculation and interpretation of “improvement scores” on standardized educational tests in Massachusetts probably provides another example of the regression fallacy. In 1999, schools were given improvement goals. For each school, the Department of Education tabulated the difference in the average score achieved by students in 1999 and in 2000. It was quickly noted that most of the worst-performing schools had met their goals, which the Department of Education took as confirmation of the soundness of their policies. However, it was also noted that many of the supposedly best schools in the Commonwealth, such as Brookline High School (with 18 National Merit Scholarship finalists) were declared to have failed. As in many cases involving statistics and public policy, the issue is debated, but “improvement scores” were not announced in subsequent years and the findings appear to be a case of regression to the mean. The psychologist Daniel Kahneman, winner of the 2002 Nobel Memorial Prize in Economic Sciences, pointed out that regression to the mean might explain why rebukes can seem to improve performance, while praise seems to backfire. To put Kahneman's story in simple terms, when one makes a severe mistake, their performance will later usually return to average level anyway. This will seem as an improvement and as "proof" of a belief that it is better to criticize than to praise (held especially by anyone who is willing to criticize at that "low" moment). In the contrary situation, when one happens to perform high above average, their performance will also tend to return to the average level later on; the change will be perceived as a deterioration and any initial praise following the first performance as a cause of that deterioration. Just because criticizing or praising precedes the regression toward the mean, the act of criticizing or of praising is falsely attributed causality. The regression fallacy is also explained in Rolf Dobelli's The Art of Thinking Clearly. UK law enforcement policies have encouraged the visible siting of static or mobile speed cameras at accident blackspots. This policy was justified by a perception that there is a corresponding reduction in serious road traffic accidents after a camera is set up. However, statisticians have pointed out that, although there is a net benefit in lives saved, failure to take into account the effects of regression to the mean results in the beneficial effects being overstated. Statistical analysts have long recognized the effect of regression to the mean in sports; they even have a special name for it: the “sophomore slump”. For example, Carmelo Anthony of the NBA’s Denver Nuggets had an outstanding rookie season in 2004. It was so outstanding, in fact, that he could not possibly be expected to repeat it: in 2005, Anthony’s numbers had dropped from his rookie season. The reasons for the “sophomore slump” abound, as sports are all about adjustment and counter-adjustment, but luck-based excellence as a rookie is as good a reason as any. Regression to the mean in sports performance may also be the reason for the apparent “Sports Illustrated cover jinx” and the “Madden Curse”. John Hollinger has an alternate name for the phenomenon of regression to the mean: the “fluke rule”, while Bill James calls it the “Plexiglas Principle”. Because popular lore has focused on regression toward the mean as an account of declining performance of athletes from one season to the next, it has usually overlooked the fact that such regression can also account for improved performance. For example, if one looks at the batting average of Major League Baseball players in one season, those whose batting average was above the league mean tend to regress downward toward the mean the following year, while those whose batting average was below the mean tend to progress upward toward the mean the following year. Regression toward the mean simply says that, following an extreme random event, the next random event is likely to be less extreme. In no sense does the future event "compensate for" or "even out" the previous event, though this is assumed in the gambler's fallacy (and the variant law of averages). Similarly, the law of large numbers states that in the long term, the average will tend towards the expected value, but makes no statement about individual trials. For example, following a run of 10 heads on a flip of a fair coin (a rare, extreme event), regression to the mean states that the next run of heads will likely be less than 10, while the law of large numbers states that in the long term, this event will likely average out, and the average fraction of heads will tend to 1/2. By contrast, the gambler's fallacy incorrectly assumes that the coin is now "due" for a run of tails to balance out. This is the definition of regression toward the mean that closely follows Sir Francis Galton's original usage. This shows the role rxy plays in the regression line of standardized data points. If −1 < rxy < 1, then we say that the data points exhibit regression toward the mean. In other words, if linear regression is the appropriate model for a set of data points whose sample correlation coefficient is not perfect, then there is regression toward the mean. The predicted (or fitted) standardized value of y is closer to its mean than the standardized value of x is to its mean. with the reverse inequalities holding for c < μ.
then we say that X1 and X2 show regression toward the mean. This definition accords closely with the current common usage, evolved from Galton's original usage, of the term "regression toward the mean." It is "restrictive" in the sense that not every bivariate distribution with identical marginal distributions exhibits regression toward the mean (under this definition). where EX and EY are the expected values of X and Y, respectively, and σx and σy are the standard deviations of X and Y, respectively. Hence the conditional expected value of Y, given that X is t standard deviations above its mean (and that includes the case where it's below its mean, when t < 0), is rt standard deviations above the mean of Y. Since |r| ≤ 1, Y is no farther from the mean than X is, as measured in the number of standard deviations. Hence, if 0 ≤ r < 1, then (X, Y) shows regression toward the mean (by this definition). The following definition of reversion toward the mean has been proposed by Samuels as an alternative to the more restrictive definition of regression toward the mean above. This definition is "general" in the sense that every bivariate distribution with identical marginal distributions exhibits reversion toward the mean. ^ Stigler, Stephen M (1997). "Regression toward the mean, historically considered". Statistical Methods in Medical Research. 6 (2): 103–114. doi:10.1191/096228097676361431. PMID 9261910. ^ Chiolero, A; Paradis, G; Rich, B; Hanley, JA (2013). "Assessing the Relationship between the Baseline Value of a Continuous Variable and Subsequent Change Over Time". Frontiers in Public Health. 1: 29. doi:10.3389/fpubh.2013.00029. PMC 3854983. PMID 24350198. ^ Stigler, Stephen M. (2010-07-01). "Darwin, Galton and the Statistical Enlightenment". Journal of the Royal Statistical Society, Series A. 173 (3): 469–482, 477. doi:10.1111/j.1467-985X.2010.00643.x. ISSN 1467-985X. ^ a b c Myra L. Samuels (November 1991). "Statistical Reversion Toward the Mean: More Universal than Regression Toward the Mean". The American Statistician. 45 (4): 344–346. doi:10.2307/2684474. JSTOR 2684474. .
^ Jeremy Siegel (2007). Stocks for the Long Run (4th ed.). McGraw–Hill. pp. 13, 28–29. ISBN 978-0071494700. ^ "A statistical review of 'Thinking, Fast and Slow' by Daniel Kahneman - Burns Statistics". Burns Statistics. 2013-11-11. Retrieved 2018-06-22. ^ "What is regression to the mean? Definition and examples". conceptually.org. Retrieved October 25, 2017. ^ a b c Galton, F. (1886). "Regression towards mediocrity in hereditary stature". The Journal of the Anthropological Institute of Great Britain and Ireland. 15: 246–263. doi:10.2307/2841583. JSTOR 2841583. ^ Hotelling, H. (1934). Open Letters, Journal of the American Statistical Association, 29, 198–199. ^ Mountain, L. (2006). "Safety cameras: Stealth tax or life-savers?". Significance. 3 (3): 111–113. doi:10.1111/j.1740-9713.2006.00179.x. ^ Maher, M.; Mountain, L. (2009). "The sensitivity of estimates of regression to the mean". Accident Analysis & Prevention. 41 (4): 861–8. doi:10.1016/j.aap.2009.04.020. PMID 19540977. ^ For an illustration see Nate Silver, "Randomness: Catch the Fever! ", Baseball Prospectus, May 14, 2003. J.M. Bland and D.G. Altman (June 1994). "Statistic Notes: Regression towards the mean". British Medical Journal. 308 (6942): 1499. doi:10.1136/bmj.308.6942.1499. PMC 2540330. PMID 8019287. Article, including a diagram of Galton's original data. Michael R. Chernick & Robert H. Friis (2003). Introductory Biostatistics for the Health Sciences. Wiley-Interscience. p. 272. ISBN 978-0-471-41137-6. Edward J. Dudewicz & Satya N. Mishra (1988). "Section 14.1: Estimation of regression parameters; Linear models". Modern Mathematical Statistics. John Wiley & Sons. ISBN 978-0-471-81472-6. Francis Galton (1886). "Regression towards mediocrity in hereditary stature" (PDF). The Journal of the Anthropological Institute of Great Britain and Ireland. 15: 246–263. doi:10.2307/2841583. JSTOR 2841583. Donald F. Morrison (1967). "Chapter 3: Samples from the Multivariate Normal Population". Multivariate Statistical Methods. McGraw-Hill. ISBN 978-0-534-38778-5. Stephen M. Stigler (1999). "Chapter 9". Statistics on the Table. Harvard University Press. Myra L. Samuels (November 1991). "Statistical Reversion Toward the Mean: More Universal than Regression Toward the Mean". The American Statistician. 45 (4): 344–346. doi:10.2307/2684474. JSTOR 2684474. Stephen Senn. Regression: A New Mode for an Old Meaning, The American Statistician, Vol 44, No 2 (May 1990), pp. 181–183. David C. Schmittlein. Surprising Inferences from unsurprising Observations: Do Conditional Expectations really regress to the Mean? The American Statistician, Vol 43, No 3 (August 1989), pp. 176–183. Regression to the mean: what it is and how to deal with it, International Journal of Epidemiology. A non-mathematical explanation of regression toward the mean. A simulation of regression toward the mean. Massachusetts standardized test scores, interpreted by a statistician as an example of regression: see discussion in sci.stat.edu and its continuation. Gary Smith, What the Luck: The Surprising Role of Chance in Our Everyday Lives, New York: Overlook, London: Duckworth. ISBN 978-1-4683-1375-8.